Next Tuesday (time TBD), April 9, the Landmarks Preservation Commission (LPC) will hear an application to transfer air rights from the landmarked 4 St. Mark’s Place across the street to enable a 20% increase in the size of a planned boutique office tower at 3 St. Mark’s Place (at 3rd Avenue). We will be there to urge the Commission to vote it down, and we need your help! This is further expansion of “Silicon Alley” and “Midtown South” into Greenwich Village and the East Village, and the LPC should not abet that encroachment. With the City Council’s approval last year of the Mayor’s rezoning for a huge new “Tech Hub” on 14th Street, and none of the meager promised neighborhood protections which were supposed to accompany it yet enacted, we can expect to see more of the same in the weeks and months ahead. And come to the hearing on Tuesday at the LPC (Municipal Bldg. One Centre St., 9th fl. 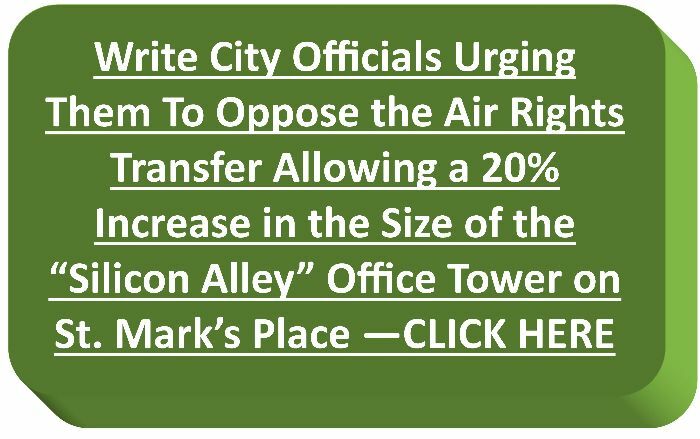 ), and testify AGAINST the proposed air rights transfer. Use the sample letter here as model testimony, and check here after Friday afternoon for the approximate time of the hearing, or click here and enter“4 St. Mark’s” to get a notification of the hearing time and future hearings.